14 November 2018 (Toronto, ON) - On Wednesday, January 16, 2019 Chris Cornell’s legacy and contribution to music history will be honoured with a star-studded concert event, I Am The Highway: A Tribute to Chris Cornell, at The Forum in Los Angeles. I Am The Highway: A Tribute to Chris Cornell will be an epic night of music, taking fans on an unforgettable journey through Chris’s legendary career and catalogue, with performances by members of Soundgarden, Audioslave, Temple of the Dog, plus special performances by Foo Fighters, Metallica and Ryan Adams and more. The show is presented by Chris’s family and closest friends, with Jimmy Kimmel hosting the special night. “We are honoured to have all these amazing artists and friends come together to pay tribute to and show their love and appreciation for Chris, his music and the mark he’s left on the world. We look forward to sharing this night with all the fans,” said Vicky Cornell. The host committee includes Vicky Cornell, Tom Morello, Matt Cameron, Brad Pitt, Josh and Kathryn Brolin, Jimmy Kimmel, Tom Hanks and Rita Wilson, Courteney Cox, Kaley Cuoco, David Spade, John Carter Cash, Linda Ramone, Andrea & Paul Joseph, Cynthia Pett, Peter Berg, Sam and Aaron Taylor-Johnson, Marc Gurvitz & Julianne Phillips, Ron Laffitte, Michael Rapino, Brent Smith and Lisa Engel, Michele Bernstein, Patrick Whitesell, Scott Sartiano, Michael Cooper, Nicholas Karayiannis, Eric Esrailian, and Paul and Renee Haas. In keeping with Chris’s vision to protect the world’s most vulnerable children, the evening will benefit the Chris and Vicky Cornell Foundation (chrisandvickycornellfoundation.org/) as well as The Epidermolysis Bullosa Medical Research Foundation (www.ebmrf.org), a nonprofit dedicated to raising funds and awareness for this painful and debilitating genetic disorder, a very personal cause that Chris cared deeply about and supported through his commitment to helping others. On November 16, fans can celebrate the recorded legacy of musical icon and singer/songwriter Chris Cornell with the 17-track self-titled album, Chris Cornell, and a 64-track limited-edition deluxe box set (11 of them unreleased). The first release since his passing in 2017, the album will be released by Cornell’s wife, Vicky Cornell on behalf of The Chris Cornell Estate through Ume/Universal Music Canada, the country’s leading music company. Chris Cornell commemorates his life and legacy not only as a singer, but as a poet and one of the most prolific writers and greatest voices of the modern rock era. 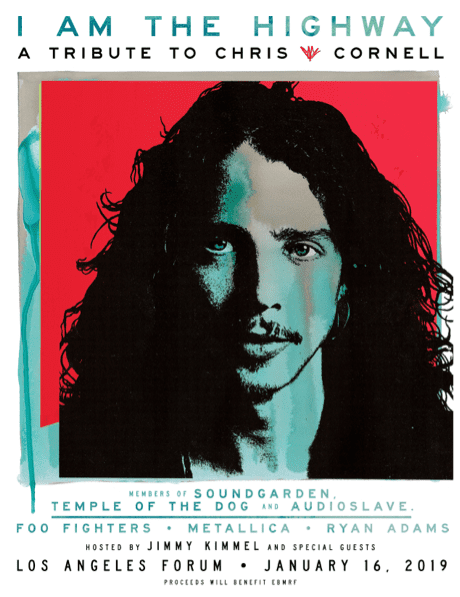 Vicky, worked extensively with Chris’s bandmates and friends to compile a collection of material from the late artist’s expansive career, showcasing his contribution to music history with selections culled from the deep catalogs of his three influential bands— Soundgarden, Temple of the Dog and Audioslave— as well as songs from his solo career. She turned to producer Brendan O’Brien, who was a trusted partner to Cornell over the years and Jeff Ament who created the packaging for Chris Cornell. More details about the release of Chris Cornell can be found HERE.